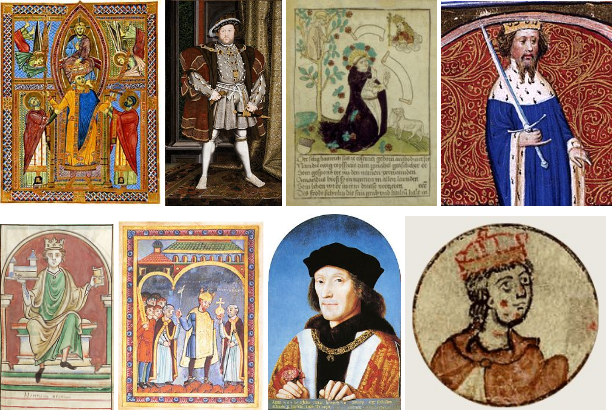 Are you confused by all the medieval people named Henry? Cait Stevenson provides you this awesome guide! Which was won by Henry II of Castile. When the Wikipedia disambiguation page for Henry III alone has 16 entries (two of whom double as a Henry I and Henry IV), it can be troublesome to keep all the “other” Henrys straight. Fortunately, we’re here to help! Henry I (d. 1135): With wife Matilda, had a son named William who married a Matilda and a daughter named Matilda who married a Henry, because the Middle Ages love you and want you to be happy. Compared to the two most famous Henrys of England, the First starts off strong in the relationship drama department with at least 21 illegitimate children; he also earned a good portion of his military reputation fighting against relatives in northern France. It’s only in the Church department that this Henry falls short. His branch of the investiture controversy didn’t even get him excommunicated. Henry III (1207-1272): Possibly the only Henry whose sons took his side in the inevitable revolt of the nobility. In the unenviable position of trying to assert his authority as king and his authority as king in the wake of John’s disastrous reign and years of powerful regency rule while Henry grew up, the Third watched every plan he made get thwarted. Scholars typically stress his piety, because the drama during his reign is all about his advisers. Dante’s placement of Henry in Purgatory is less bad than it could have been, which is a nice summation of his reign as well. Henry IV (1367-1413): Seriously, you’ve got two Shakespeare plays. Get on that. Henry VI: Oversaw (part of) the Hundred Years’ War and the War of the Roses; lost the Hundred Years’ War and (part of) the War of the Roses. Suffered the indignity and terror of deposition and imprisonment in the Tower of London not once but twice, the second time ending in his murder. The Sixth certainly lived up to the action and adventure we expect from a medieval Henry, but from the wrong end. Henry VII (1457-1509): Ended the War of the Roses by winning a battle, seizing the throne, and uniting Lancastrian and Yorkist causes in marriage, the last of which would seem to shatter all Game of Thrones parallels (OR DOES IT?). He did a much better job rebuilding a kingdom out of warring high nobility than Henry III had, it seems. Does conflict with the pope even count if it’s just about money? Let’s just call it the English throne biding its time. But he found out you can’t hurry fate even if it’s only in legend, when his son and heir Arthur died rather than returning from Avalon to restore Britain to glory. Henry VIII (1491-1547): Let’s pause for a moment to consider the irony that Henry set aside Anne of Cleves because she was too ugly. Henry of Ghent (c.1220-1293): Regent master in theology at the University of Paris. What modern scholars of philosophy tend to highlight in his work are questions about what is so special about God versus everything else: knowledge of God and knowledge of creatures; divine acts of creation versus human acts of imagination. One of the most important post-Thomas Aquinas/Bonaventure lightning rods for the eternal “secular clergy versus mendicants” animosity at Paris for very reasonably pointing out that yes, the Fourth Lateran Council really did require people to make annual confession to their parish priest, not a friar. Henry Suso (Heinrich Seuse) (c.1295-1366): Beloved German Dominican preacher and author whose work frequently sought to translate speculative mysticism and the severe, dangerous saintly life into a more practical and accessible journey to God through meditation on suffering and Christ’s suffering. His devotion to the Holy Name of Jesus (HIS) and teachings on how to die well in the mid-14th century presaged the fifteenth century obsession with those topics, and helped make his Little Book of Wisdom the most popular German vernacular text. Heinrich von Langenstein (c.1325-1397): His activism in Great Schism politics took him from Paris to various leadership roles at the University of Vienna, spurred him to help outline the conciliar theory that would shape 15th century Church politics, and informed the writing of vitriolic treatises against false prophets. At Vienna, he was one of the most important early voices to advocate the gathering of current theological knowledge and translating it into religious principles for lay Christians to learn—ultimately leading to modern understanding of “religion” as a set of beliefs to assent. Heinrich Kramer (c. 1430-1505): Wrote the Malleus Maleficarum. Yes, that one. Henry (VII) (1211-1242): I’m not making up those parantheses, which tells you all you need to know about this son of Emperor Frederick II who just couldn’t catch a break. Frederick had him crowned King of Sicily as an infant to keep Sicily under German control, but took back the crown when Henry was 6. He was placed in symbolic charge of Burgundy at age 8 and lost that just a year later. When he was crowned King of the Romans in 1220, half the German nobility and the pope refused to recognize him because of a petty little disagreement with Henry’s dad. In 1228, Henry took a stand against some powerful nobles for plotting against his father, only to have his father undo some of Henry’s most important laws and have the nobles force him to grant them more power over his supporters in the cities. He stood up for peasants in 1234, which got him (a) excommunicated by the Church (b) declared an outlaw by his father. Poor Henry’s rebellion ultimately failed, and the various rumors about his death say he was (a) killed by his father (b) killed on his father’s orders (c) killed himself to avoid being killed by his father or (d) died completely by accident, nothing to see here, move along. And if that’s not tragic enough for you—he expected as a child to marry one princess, was set up in adolescence with another by a bishop, maneuvered towards yet another by the German princes, and finally forced to marry someone else for his father’s political ambitions. Through all this, poor Henry is said to have greatly supported poets and written his own love poetry. Henry the Lion (c.1130-1180): Most importantly husband to the Matilda of England who wasn’t an empress, this Henry also made an Emperor Frederick [Barbarossa] very very angry, except he did it by being as competent and fierce as his moniker suggests. Consolidating his own territories and nurturing cities in the pivotal twelfth century, he somehow found time to help Barbarossa in Italy. Until one time he didn’t, Barbarossa got mad, and forced Henry into the most dreaded situation imaginable: staying with his in-laws. Enrico Dandolo (c.1107-1205): He was ninety-six and blind, he conquered Constantinople by accident, and somehow there is still not a Hollywood movie about this. Henry I (876-936): Founded a dynasty and it’s not even named after him. Henry II (973-1024): After a string of successful Ottos, the Second brought the dynasty to a strong close by paying attention to both Germany and Italy, putting down rebellions where they sparked up, and simply failing to produce a biological heir. On the other hand, his relationship with both German clergy and with the pope was strong and positive enough that he is actually St. Henry, which I’m pretty sure disqualifies him from being a medieval royal Henry. Henry III (1046-1056): Any emperor can be crowned by a pope; Henry was the emperor who crowned a pope. Had dealings with men named Zemuzil, Wazo, Pandulf, and Drogo, which is a relief because he naturally named two of his own kids Henry and Matilda. I Henry, king by the grace of God, do say unto thee, together with all our bishops: Descend, descend, to be damned throughout the ages.